Becoming an Old Woman – How Did That Happen? Several years ago my daughter brought me a book of poems and reflections on growing old. When she gave it to me she assured me she did not think I was old – but she thought I would enjoy looking at my mother’s world (since my mother was old). Too quickly the years have passed. My mother is now deceased (how strange that sounds) and I AM becoming the old woman in the family. I laughed when I first read this poem. I still laugh – but I relate to it so much more than I did when she gave it to me. So – for all my “old lady friends” I want to share this poem by Jenny Joseph. 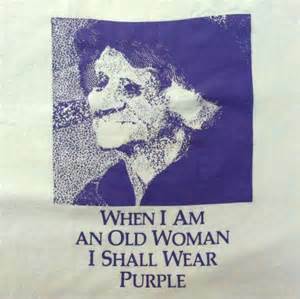 So – friend if you see me in purple with a red hat – know that I am an old woman for sure! This entry was posted in Christian Life, Family Life, Joys of Grandparenting and tagged Grandchildren, Grandparents, Growing old, Jenny Joseph., Red Hat Society, Retirement, Wearing Purple by Barbara Lane. Bookmark the permalink.